In this beef tenderloin recipe, filet mignon is grilled and served with shiitakes in a robust sauce infused with smoky morita chiles. 1. Position a broiler rack about 6 inches from the source of heat and preheat the broiler. Place the tomatillos on the rack. Broil, turning the tomatillos occasionally, until they are lightly browned on all sides, about 7 minutes. Do not overcook, or the tomatillos will burst. Transfer to a plate and let cool. 2. Bring the water to a boil in a small saucepan over high heat. Add the morita or chipotle chiles, reduce the heat to medium-low, and simmer for 5 minutes, or until the chiles soften. Remove from the heat. 3. Heat the oil in a large skillet over medium-high heat. Add the shiitakes and cook, stirring occasionally, until tender, about 10 minutes. Set aside. 5. Prepare a hot fire in a charcoal grill, or preheat a gas grill to high. Meanwhile, remove the beef from the refrigerator, season to taste with salt and pepper, and let stand at room temperature while the grill is heating. 7. Meanwhile, position the rack about 6 inches from the heat source and preheat the broiler. Top each filet with a slice of cheese. Place them on the broiler rack and broil just until the cheese melts. 8. To serve, place each filet on a warmed dinner plate and surround with mushrooms in sauce, drizzling some of the sauce over the steak. Garnish with the cilantro and serve immediately. Because of the smokiness of the morita chile and the meatiness of the beef, I like to pair this dish with a Syrah from the northern Rhone. Cote-Rotie, Cornas, and Crozes-hermitage from producers such as Guigal, Chapoutier, Jean-Luc Colombo, and Jaboulet offer a large range of possibilities. 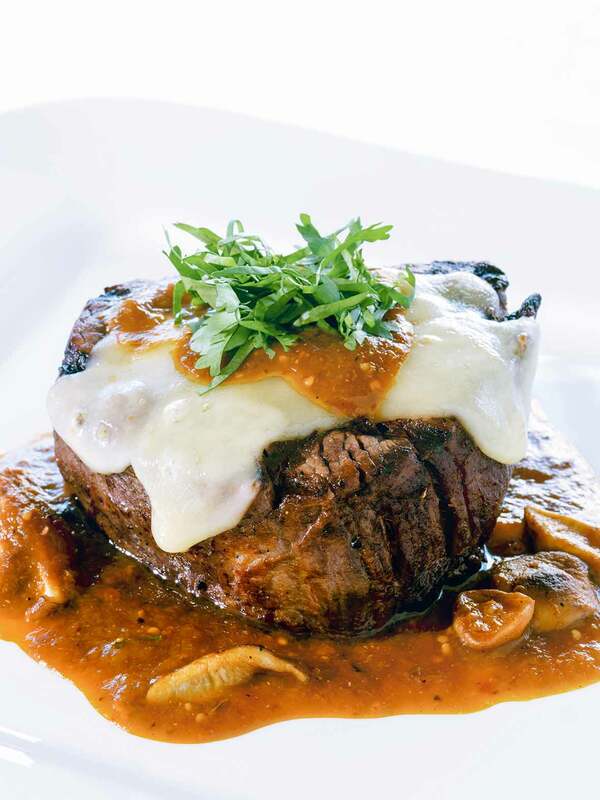 Filet Mignon and Shiitakes in a Chile Sauce Recipe © 2009 Priscila Satkoff. Photo © 2009 Jeff Kauck. All rights reserved. All recipes and photos used with permission of the publisher.